We've been doing a bit of research lately into sustainable graphic design, so we figured it might be good to share the information we've picked up on the way. It's by no means comprehensive, and hopefully most of it you already know, whether you're a designer or someone who commissions design. But, hey, sometimes it's good to take another look at this stuff. So, you're getting ready to create something printed. But you'd rather not damage the planet too much while you do it. What are your options? Using recycled paper is the definitely the best way to go. Making recycled paper uses up to 50% less energy than using trees; uses less water; involves fewer chemical processes; and reduces the amount of waste heading to landfill (the UK's landfill sites are due to be full within a decade). And thanks to the improved manufacturing processes, the quality of recycled stocks is really fantastic. Ideally you should aim for paper that is 100% recycled. Failing that, a paper that contains a percentage of recycled material, with the rest coming from sustainable forests. Be wary of papers that feature percentages of mill broke, which is scrap generated in a mill before the papermaking process is finished. That stuff should be recycled as standard on all papers. The NAPM (National Association of Paper Merchants) mark is the most helpful one to look for, as it shows how much of the stock is recycled. There's a full list of their approved stocks here. If you can't use a recycled stock, then at least make sure that your paper comes from carefully managed forests. Again, there are loads of different schemes that claim to cover this area, but the only one really worth looking for is the FSC (Forest Stewardship Council) one. FSC approved stocks will all feature the FSC mark, which will rate them according to their proportions of certified virgin fibre. They'll either be FSC 100% (made only from certified virgin fibre); FSC Mixed Sources (made from a percentage of certified virgin fibre, and the rest from either non-certified or recycled sources); or FSC Recycled (made from 100% post-consumer recycled fibre). Sometimes, but not always, the mark will show what percentage of the stock is recycled, using the mobius strip icon. The FSC papers are definitely a good thing. But apart from the FSC Recycled papers, you're still cutting down trees, even if they are carefully managed. There's a bunch of other stuff you can do as a designer to lessen your design's impact on the environment. - Try paper not made from wood. GF Smith's Crane's Crest is made from cotton. - Ask your printer to use soy inks rather than oil based inks. Beacon Press can help. - Recycle all the paper you're using in your office too, and print on both sides of the paper when you're printing stuff out. 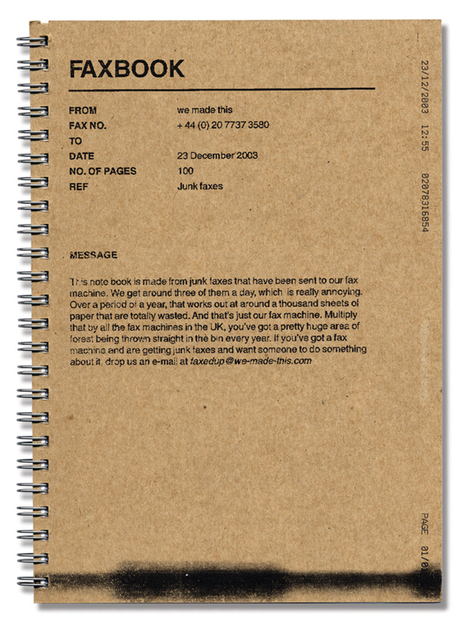 We used to have a fax machine, and got loads of junk faxes sent to it, so we turned them into notebooks for the studio. Also, why not use the Recycle Now mark. It helps advertise the fact that you're using recycled stocks, and encourages people to recycle your work. A lovely site by Caroline Clark which covers everything we've mentioned here, but in far greater detail. A leading supplier of recycled papers. They've got lots of great information about recycling and how it works. WRAP is a not-for-profit company supported by funding from DEFRA and the DTI. WRAP's mission is "to accelerate resource efficiency by creating efficient markets for recycled materials and products, while removing barriers to waste minimisation, re-use and recycling". Which is quite a mouthful. But they've got a huge amount of information about paper and recycling. Check out their Office and Publication Papers PDF - lots of great advice. All the information about paper and recycling gathered by David Shorto, print and paper buyer for Friends of the Earth and Greenpeace; it has a great tips for designers page. Good general information about using recycled stocks. A wonderful report which explores how graphic designers should be thinking about sustainability. Lots of useful links in their environment section. They also produce a Rough Guide to environmental paper. If you've got any more information that you think could be shared, or if you think we've got something totally wrong, do drop us an email, or chuck us a comment below. This post is part of Blog Action Day. The idea is that all around the world, on October 15 each year, bloggers will post on a single really big important issue. The hope is that because blogs tend to have fairly focused readerships, they can communicate very directly with their audience, and possibly effect real change. This year, for the inaugral Blog Action Day, the theme is the environment. As part of Blog Action Day, blogs have also been asked to donate any revenue they earn on the 15th to charity. 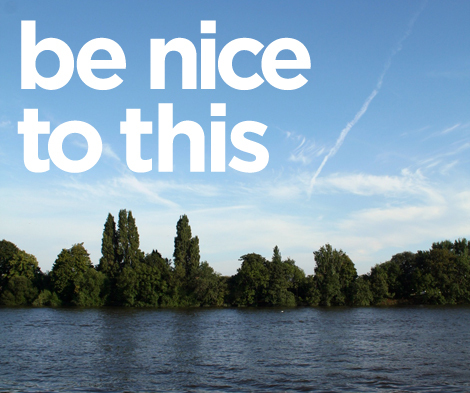 We don't run this blog as a money making venture, but if you fancy donating some of your hard earned, why not join us in giving some to Greenpeace?